With the arrival of the second session students, it is time to finally bring the first session to a close. 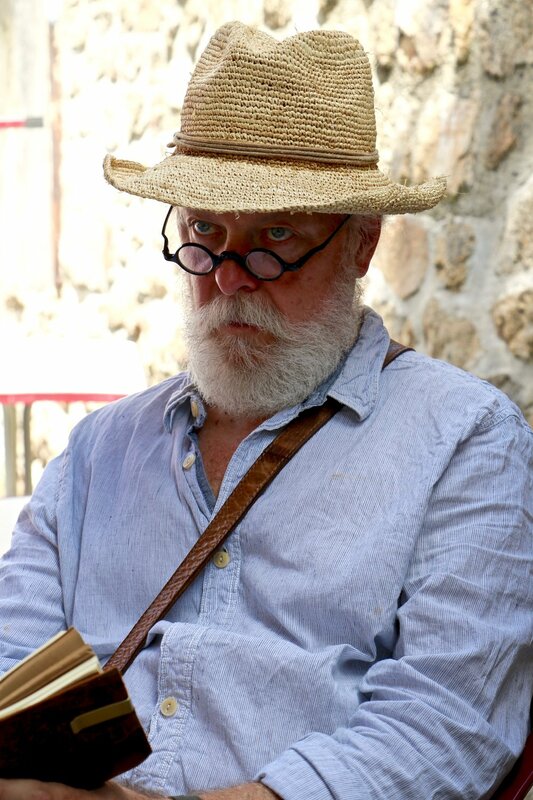 On last Sunday, everyone got dressed up for a final banquet in our nearby town of Saint-Pierreville. During our three-course classic Ardéchoise meal featuring goat’s cheese, lamb, and chestnuts, the instructors presented gifts to a few of the students. Tara and Maria João received sketchbooks and drawing pens for winning the Drawing and Painting three-day sketching marathon. Soon after, Fernando and Alyssa recognized Maria Valderrabano as a double major of Architecture and Drawing and Painting for the incredible quality and quantity of the work she managed to produce in both areas during her time at Les Tapies. 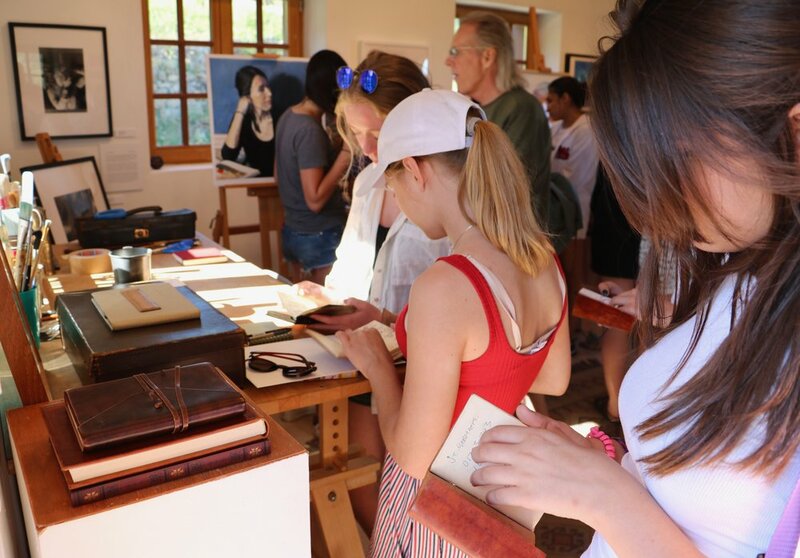 Fernando gifted Maria a book about the history of architecture in the Ardèche region of France, and Alyssa printed a copy of her own linocut carving of a raven that was created during the session. The culmination of the evening, however, was the beautiful toast that Frøya delivered, thanking the instructors and her newfound friends for such a lifechanging experience. We are just as grateful to you, Frøya, and the rest of the students, as you are to us for the impact you had and the inspiration you sparked. Finally, after a wonderful meal and many commemorative photos, we all headed back up the mountain to our hamlet for one final night together. Early the next morning with bags packed in the vans, we all gathered for our final goodbyes and last-minute promises to visit in the coming year. First session—you will be sorely missed, but we hope you have an incredible rest of your summer. And, please, keep creating wherever you go! In the last few days of the first session, everyone was in a mad dash to put together their final presentations both visually and orally. 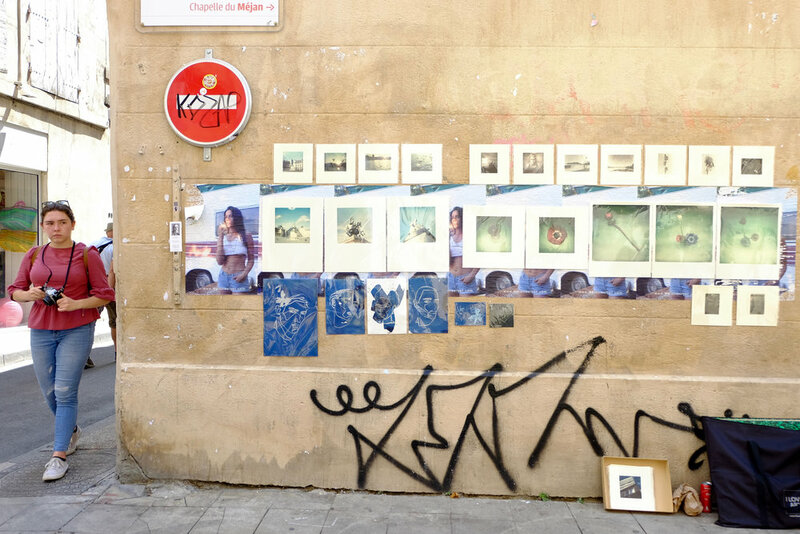 These presentations are the culmination of the students’ time at Les Tapies featuring, for the Photography majors, a selection of their best pieces produced during the last three weeks, combined with a verbal reflection on their time at the program. The Architects presented their plans for a new building at Les Tapies, which was placed, designed, and drawn entirely by them. In the process, they defended the choices they made for their building and explained how the "clients" would interact with their newly constructed home. Finally, the Drawing and Painting majors presented a selection of their best pieces, ensuring that they displayed a variety of media and techniques. Included in this array of artistic works were examples of the writing pieces the Drawing and Painting students completed during the writing portion of the major. And, like the Photo majors, they delivered a verbal reflection of their Les Tapies experience and their artistic progression during that time. Each student found a way to make their presentation a unique and complete reflection of themselves as an artist, a fact that was punctuated by the artist statements every student wrote under the guidance of Amy, our writing instructor. Each student presented for 8-10 minutes, followed by feedback from the instructors on the student’s work and his or her growth at Les Tapies. The most important aspect of these presentations, something that is critical for people to learn and utilize in any area of their lives, is developing the ability to accurately and eloquently articulate their thoughts and intentions in front of a group. All artists should be able to communicate their artistic message both in their art form, be it painting, photography, drawing, etc., and in spoken and written words. This is the lesson that we hope to teach through the final presentations, and, from the incredible finesse and articulacy with which the students presented, we believe we have achieved that goal. Our trip to Aix-en-Provence was a long, nearly three-hour drive each way, but the city and its many sights more than compensated for the journey. 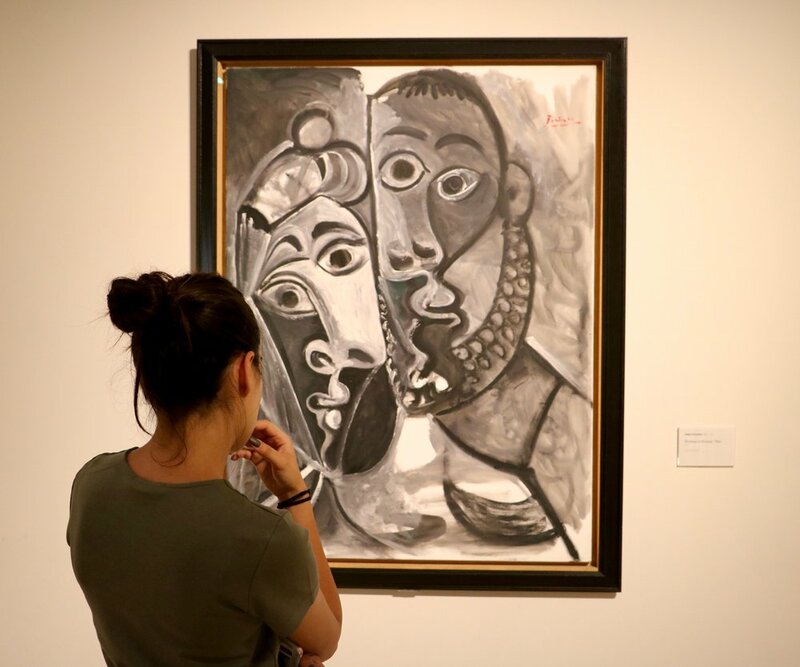 Upon arriving, we stopped first at the Musée Granet for a special exhibition of Picasso and Picabia’s works, looking at the parallels between both their artistic trajectory and their personal relationship. Next, we walked to the Planque Collection, an extension of the Granet housed in the beautiful Chapelle des Pénitents Blancs which was modified for the museum’s use in 2011. After absorbing such a significant amount of masterful art and architecture, the students were in need of some free time to shop, eat lunch, and explore the city of Aix with its interesting juxtaposition of 17th century Baroque architecture and a thriving modern society, in part due to its growing student population. 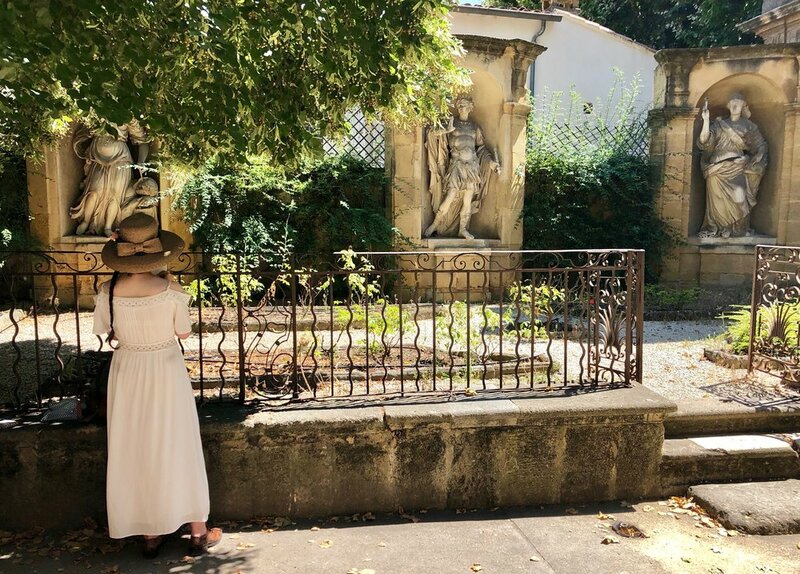 In the early afternoon, our group met at the Hotel de Ville to walk together to Paul Cezanne’s studio just outside the main sector of the city, stopping on the way in a lovely sculpture garden that is adjacent to the Cathedral Saint-Sauveur. Touring through Cezanne’s studio inspired quite a surreal atmosphere around our students as they took in the scene before them—a collection of his handwritten letters to friends and family, a shelf lined with many of the objects he actually used in his still lives, a couple of his jackets and hats hanging on their pegs, and all of the accoutrements for painting in the 19th century. The dappled light provided by the trees outside the studio lent itself well to a respite from the sun on such a long and hot day. Ambling our way back down the hill into the city center, we paused for any last-minute purchases and a couple scoops of ice cream before loading into the vans for the long drive home. On Monday, the Architecture students experienced their first Charrette. With the partners they had been working with since the first day of majors, each student presented the ideas and designs they had tirelessly detailed in their drawings for the interior of Chabanes—John and Perrin’s house just a five-minute drive down the road. Each group created their own plan for the house based on the skeletal structure of the building already in place and was made to explain the reasoning behind their choices to a jury made up of three students and two teachers—one of whom was John himself. The one exception was Uliana who, as a returning student to the program, had already participated in this particular exercise. 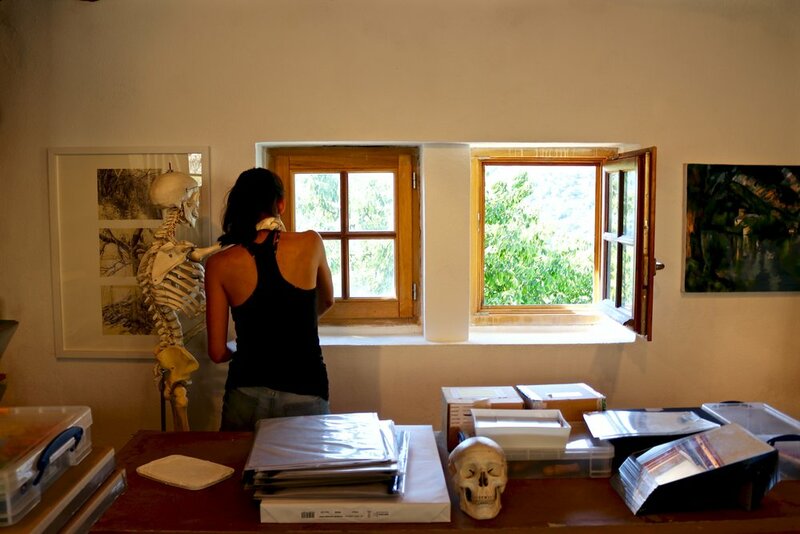 Instead, she designed an external art studio for John of her own design and placement on the site. Most of the students and instructors from the other majors came to observe and support the Architects during their presentations, and both the audience and the jury asked pertinent questions and gave both positive and constructive feedback for the five presentations. Some of the presenters in particular (aka Claudio from Milan, Italy) provided the audience with refreshing and entertaining comedic relief while detailing their layout of the house. When describing their goals in designing the space, the groups emphasized such aspects as the efficiency of natural light use, the flow of inside space, and the simplicity of design. Attempting to contend with both the unfamiliarity of Ardéchois architectural techniques and several pieces of input from the clients seemed a challenging task to say the least, but the Architecture students exceeded expectations, receiving much encouragement and praise from the jury. 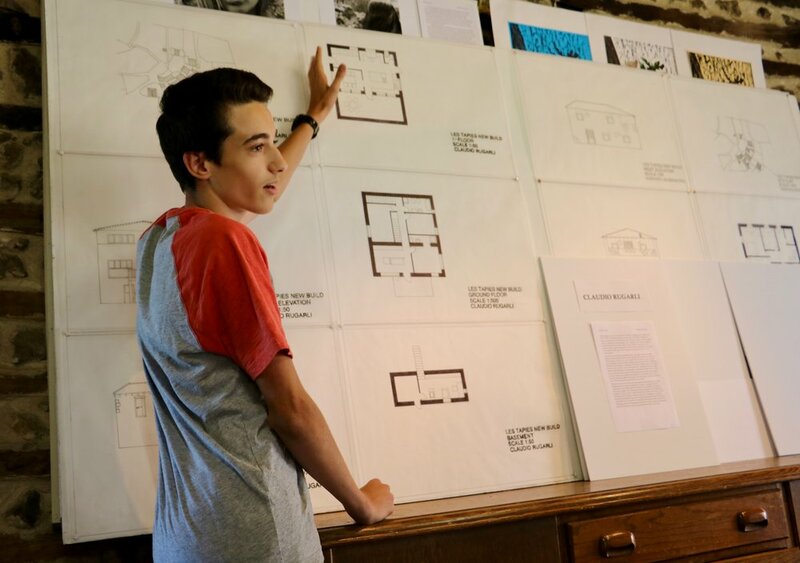 Fernando, our Architecture instructor, seemed incredibly proud of his students’ calm demeanor and articulacy while presenting, the tireless work they put into their design ideas and drawings, and their ability to work together as a team. The full moon appeared and declared it was time for a Nocturnal Session. On the terrace outside the studio, the instructors set up spotlights and a modeling platform for a life drawing exercise at night for the Drawing and Painting majors. At the mention of dramatic lighting and loud music, the Photographers decided this was an event not to miss. Even several Architects decided to show off their drawing or photographing skills given the fun and exciting atmosphere. Amy, the Les Tapies summer intern, became the artists’ muse for the night as they drew with conte chalk and experimented with shutter speeds. One of our photographers, Carolina, trudged her way up to the infinity nest overlooking the hamlet in complete darkness to capture the scene from above, but soon became distracted by the beautiful night sky, and documented it in an incredible compilation. As the night grew darker, the students struggled to see even with which color of chalk they drew, but this only added to the intrigue of the session, which ended all too soon. We are all hoping this will not be the last Nocturnal Session of the program, but only time will tell! Yesterday, the Photography majors went on a field trip to a nearby waterfall for an exercise on shutter speed. Our Photography instructor, Barry, wanted the students to use a low shutter speed in order to capture the waterfall as a velvety surface; he believes the best way to learn about technical aspects of the camera is by experimenting with different settings and analyzing the results. After making the trek through the woods to the waterfall, some of the students braved the current, impressively avoiding falling on the slippery stone surface, to perch themselves on rocks under the waterfall for a better perspective. They also learned how to handle their cameras in the rain, which meant sticking the cameras under their shirts in the worst of the rainfall. On the way back, the girls convinced Barry that a stop for coffee, tea, and cappuccinos was entirely necessary before driving back to the hamlet to develop their waterfall photos. 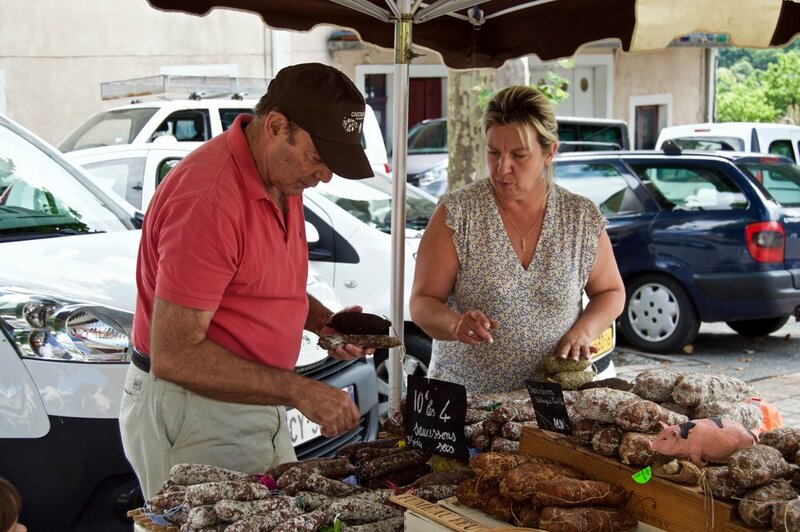 On Sunday July 1st, the Les Tapies crew traveled to Mazan Abbey in the Massif Central of the Ardèche, with a stop at the Saint-Pierreville Sunday market on the way. Upon arriving, the students viewed the Cistercian abbey for the very first time, but not, perhaps, in the way they expected. The abbey is currently playing host to a contemporary art instillation meant to attract the attention of visitors, like ourselves, and give them a new view of the 12th century abbey. At a certain viewpoint on a ridge above the abbey, all of the circles line up perfectly. The artist accomplished this project by projecting the circles onto the abbey ruins at night while he and his team painted every piece of stone illuminated by the projection. After walking through the crumbling walls of the abbey and trying to imagine what it would have looked like in its original splendor, everyone got to work. Drawing and Painting students chose the view they would attempt to capture in acrylic and began sketching prior to beginning their painting. After observing the beautiful, now ruined structure of the abbey, students in Architecture worked with Alyssa, our incredible resident watercolorist, to try their hand at watercolor perspectives. 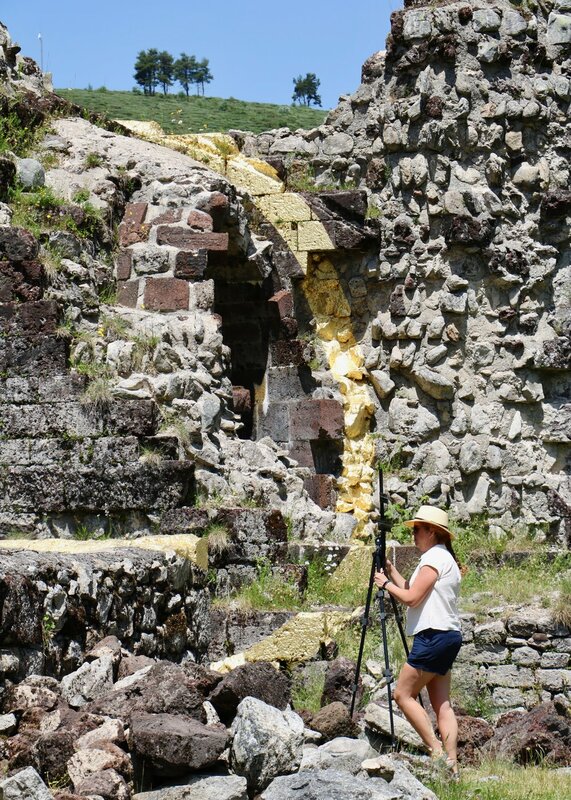 And finally, our Photographers captured the ruins both on film and digitally, looking for the texture and form of the stone, and doing their best to find unexpected angles of such an old and well-documented structure. 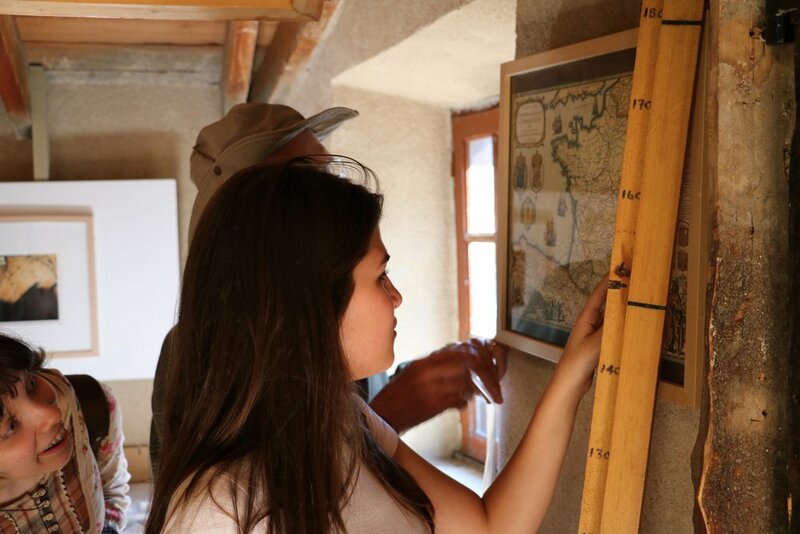 With slightly less time-consuming, but no less challenging tasks set before them, the Architecture and Photography students headed back out on the road for Les Tapies in the early afternoon, leaving the painters at their easels. After an additional three hours of work that seemed like no time at all, except for the rampant resulting sunburns, Drawing and Painting majors packed up their panels, easels, and paints. They didn’t travel straight home, however, and stopped at a viewpoint on the edge of the Massif to look out over the breathtaking landscape, pick some wildflowers to bring back to our hardworking chefs, Perrin and Jen, and enjoy the freedom of being surrounded by nothing but sun, grass, and sky. Our excursion to Avignon was a complete success with sunny weather and bearable heat. The excitement of city life was a welcome change for the day from the quiet solitude of our hillside home, and everyone, including the instructors, took the time to capitalize on the opportunity by sketching and photographing their surroundings. 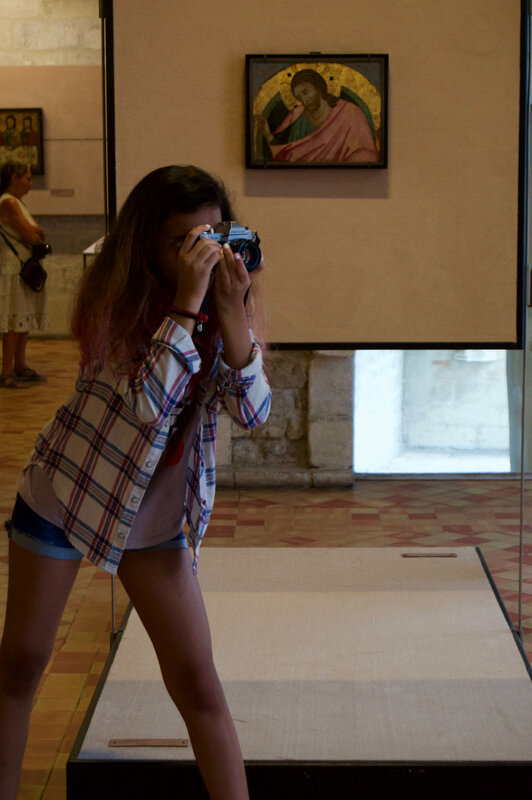 Photography and Architecture students visited Le Palais des Papes—a fortress built in the 14th century as the home for several popes during the same time as the Papal Schism. As the largest gothic palace in the world, Le Palais provided an incredible amount of architecture, art, and historical artifacts for the students to explore. 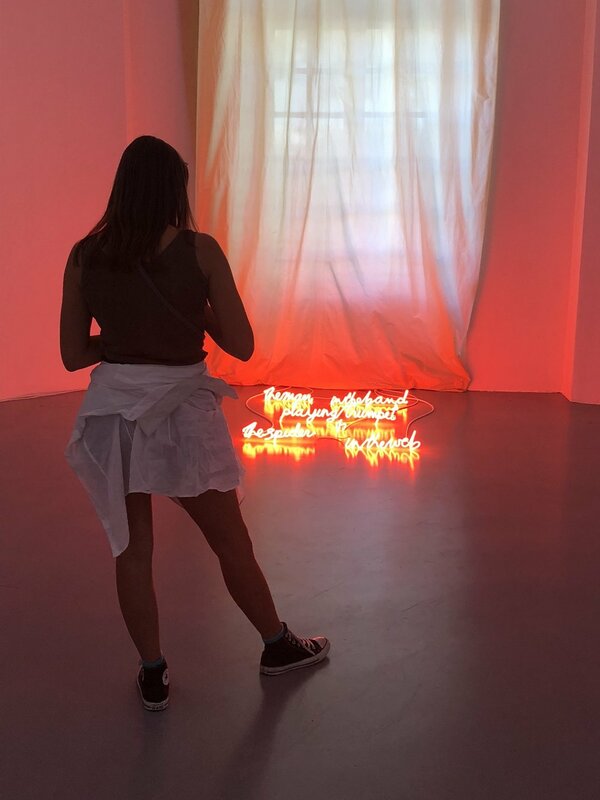 Meanwhile, the Drawing and Painting students toured through La Collection Lambert, which houses a considerable collection of modern and contemporary art with a focus on minimalism. Of course, while in Avignon, we all took advantage of the delicious cafés, restaurants, and ice cream shops. 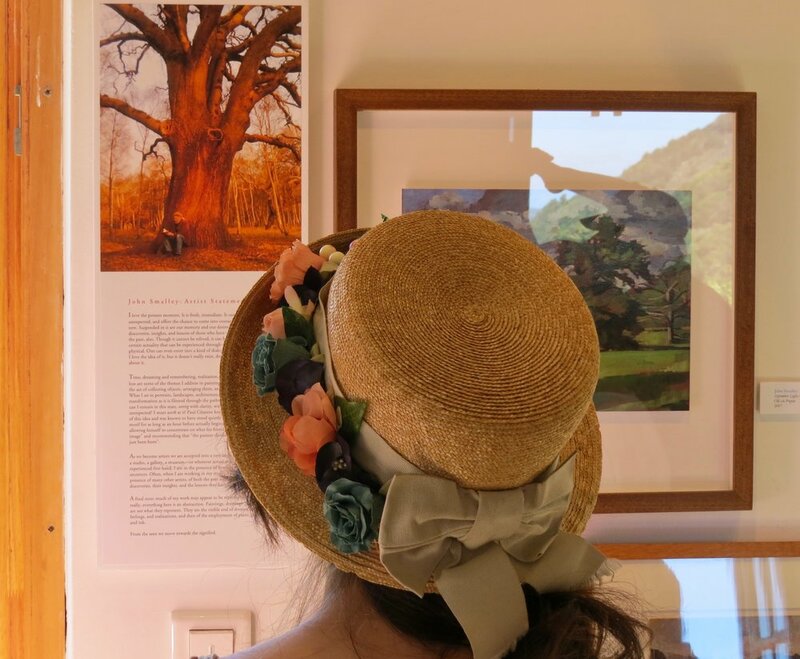 Many students also perused the many storefronts that line the streets and came away with some lovely purchases, including Maria’s two new hats from an 18th century hat shop. By the time we all left the city walls of Avignon and travelled to Le Pont du Gard, we were all feeling exhausted (though the car ride functioned as the perfect time for a nap) and ready for a refreshing swim and a cold drink while we observed the best preserved Roman aqueducts in Europe—a true architectural beauty. While some students jumped right into the chilly water, others decided to make their attempt at capturing the intimidating structure of the aqueduct on paper or on camera. By the time we finally arrived back at the hamlet, Perrin and Jen, our wonderful cooks, had a gigantic pot of gazpacho waiting for us—the perfect meal after a long, hot day. After dinner, the students began to trickle back to their rooms for some well-deserved sleep to gear up for the coming Major-Minor day. Our next outing is to Mazan, a cistercian abbey located in the Massif Central of the Ardèche—stay tuned! The students have finally arrived and we have jumped head-first into the Les Tapies routine. On Tuesday, our first full day, we all journeyed down into the village of Saint-Pierreville to walk off the jet lag and enjoy some much-needed ice cream and freshly baked pastries. The day's main event was the opening of the faculty gallery. 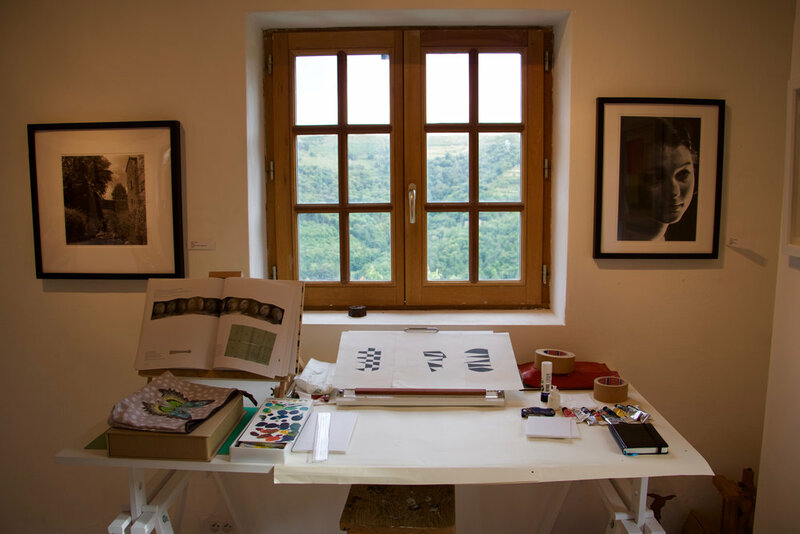 The space was covered with pieces of all artistic mediums created by the Les Tapies instructors including oil and acrylic paintings, collatype prints, film and digital photographs, letterpress prints, and mixed media pieces (using mainly paper, pastel, and paint). We were so excited to share this work with the students because Les Tapies is truly an artists' community, not simply an art camp, where the instructors and the students create art together, learn from each other's work, and grow closer as a group by sharing their artistic inspirations and passions. This presentation also featured the story of how Les Tapies came to be—both the program and the hamlet itself. Fernando Gonzalez, the founder of Les Tapies and co-director of the program, detailed the renovation process of the buildings that make up the hamlet and the importance that Les Tapies holds for him. 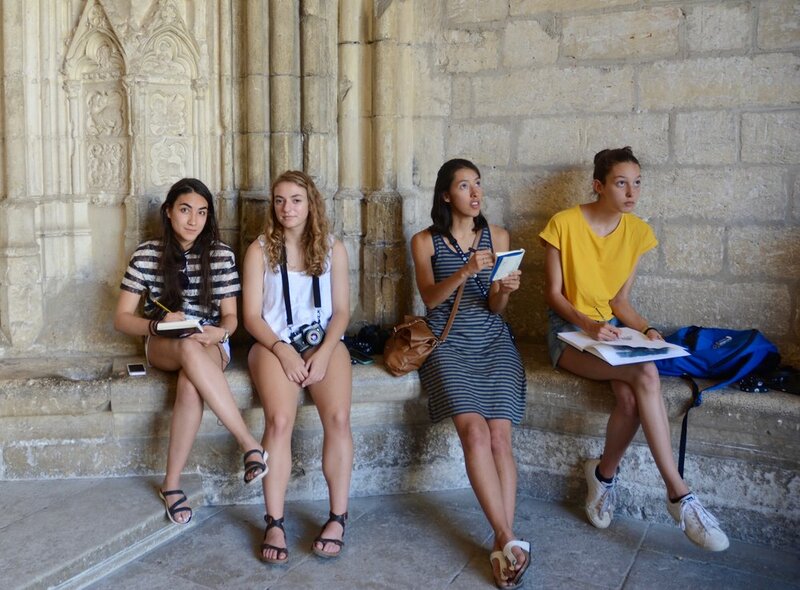 The next day, after a Morning Meeting full of exciting news of our upcoming excursion to the city of Avignon, everyone went off to their majors for the first official day of classes. Our instructors are apparently promoters of digging right in because Drawing and Painting students experienced their first life drawing session with our resident model, Camila. 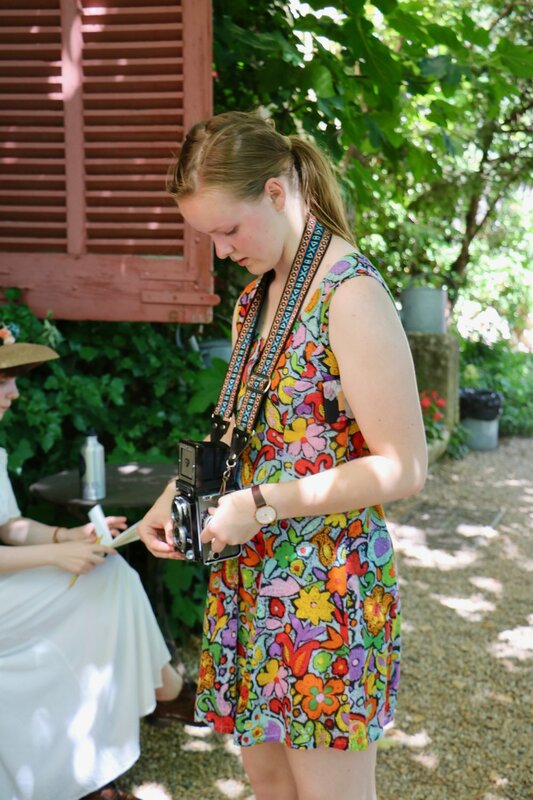 At the same time, the Photography majors explored the hamlet and shot their first roll of film, and Architecture students travelled over to the site of which they will be designing the interior for their first charette. Wednesday was also the first day of minors—students chose from Drawing and Painting, Design and Build, Photography, or Art History. And the real treat was the unveiling of Portuguese sponge cake made by one of our students, Maria. After that delicious success, we are all hoping that our diverse group will share more of their national dishes and introduce us all to new cultures and traditions. It was a day full of new experiences and hopes are running high for what is afoot in the coming weeks, especially our trip to Avignon. 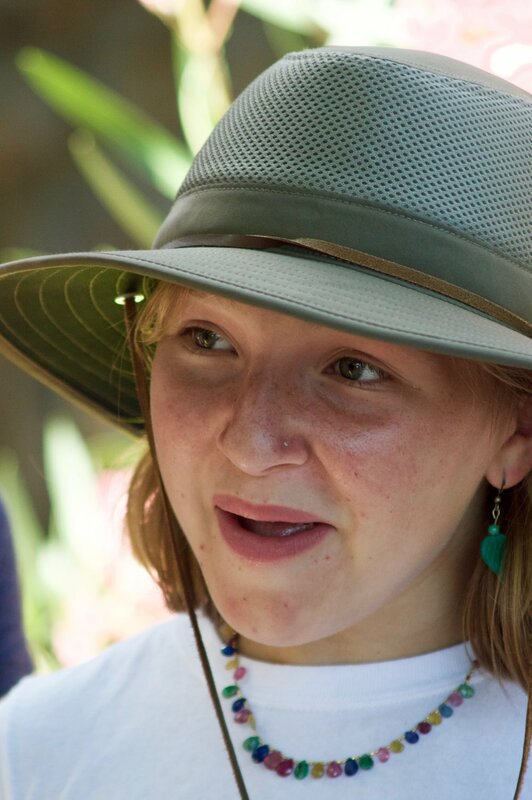 Look out for photos from that excursion in our next blog post! In rounding off the second week of the program, we made the last of our excursions before the few remaining sessions leading up to the presentations. 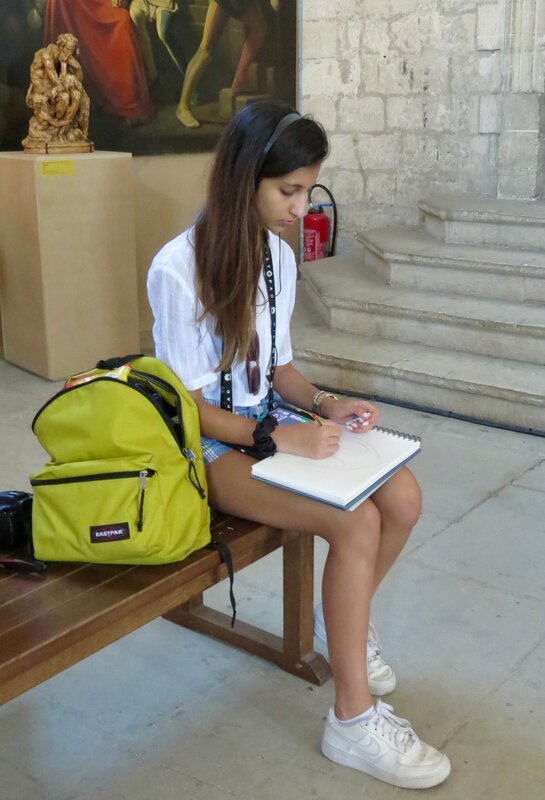 First, the photographers, along with a few extra students, had the pleasure of visiting the city of Arles for the Les Rencontres festival. 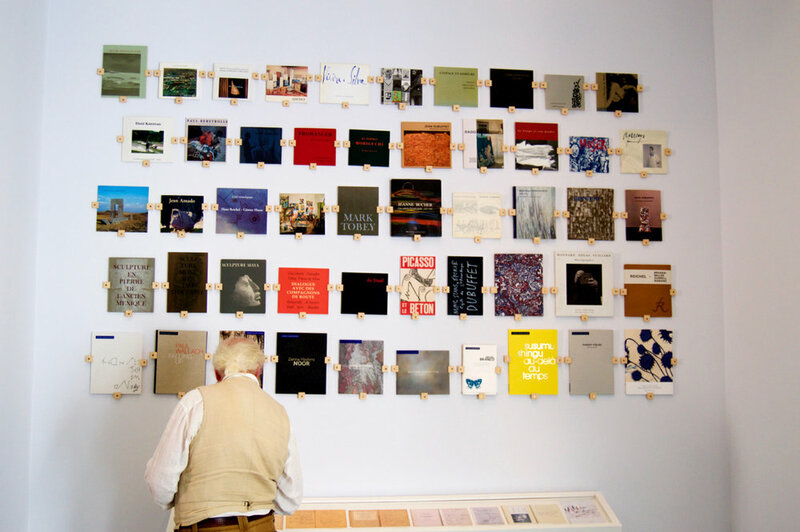 In going to the premier photography festival in the world, those who traveled were able to see contemporary photographers and their work whilst also viewing more retrospective pieces such as the early work of Annie Leibovitz. Les Rencontres provided the photographers a fantastic insight into professional fine-art photography and illuminated the different methods they can use to group and present their work for their final exhibition. 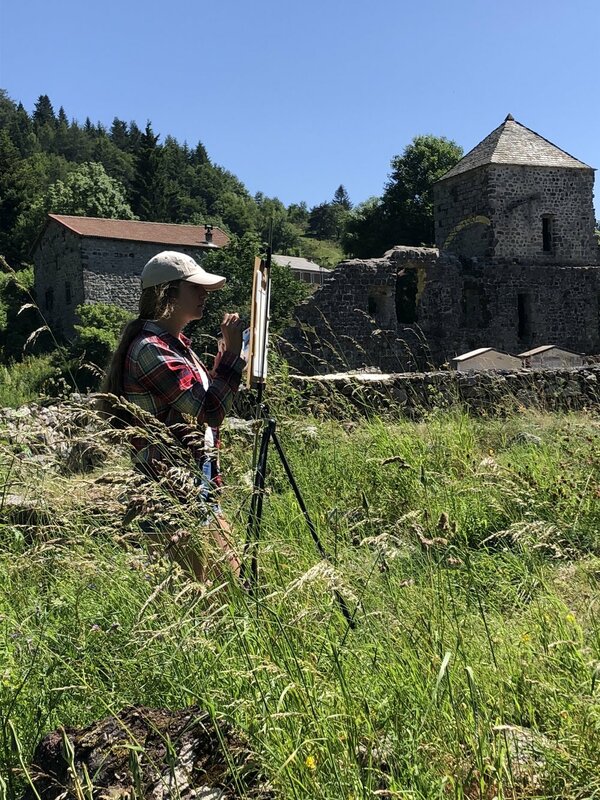 Meanwhile, drawing and paintingalong with the architecture students traveled further into the Ardèche to visit the Cistercian Abbey of Mazan. Built in the 12th century, Mazan was the predecessor to the now famous Abbey de Sénanque. Upon arrival, staff and students were both surprised to see the Abbey partially converted into a contemporary art instillation for Le Partage des Eaux program featuring across the region. 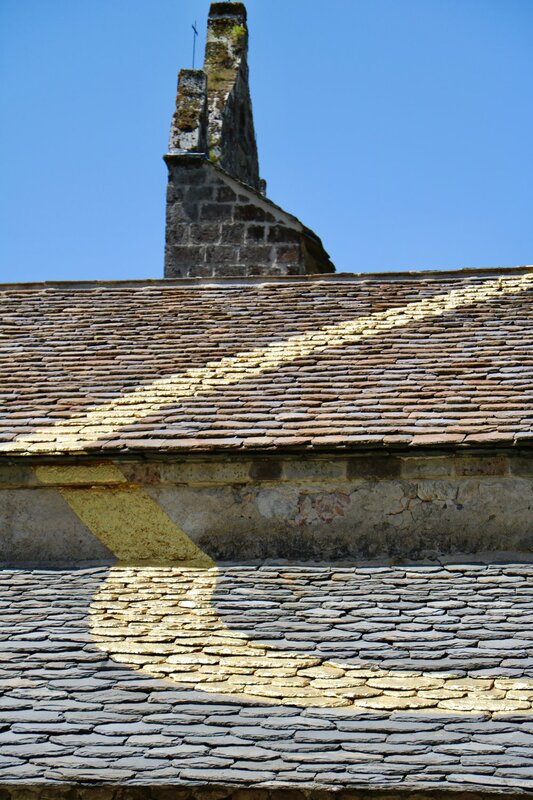 As can be seen in the photographs, the artist painted Mazan with gold circles, which can only be fully viewed at specific viewpoints in the surrounding hillsides. Nevertheless, both staff and students quickly set to touring the grounds and beginning the days work. 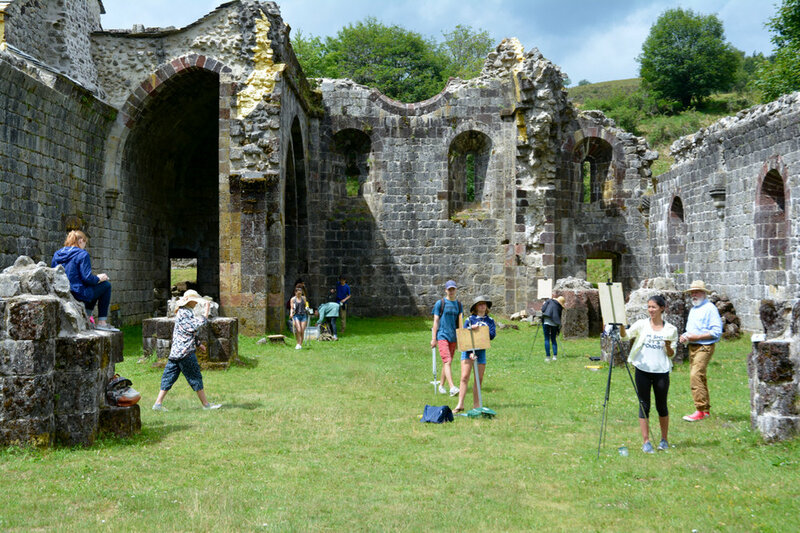 The architecture students were given a watercolour perspective tutorial, while at the same time, the drawing and painting members toured the Abbey’s grounds and settled on their own spot for an acrylic study. The trip to Mazan provided another great insight into the culture and history of the Ardèche, whilst giving both groups the chance to supplement their already growing body of work. With the last of the excursions finished, we are now going full-steam ahead for the presentations this coming Thursday and Friday. Least to say, we are all very excited to see the final pieces coming together and each student’s complete body of work coming to fruition. 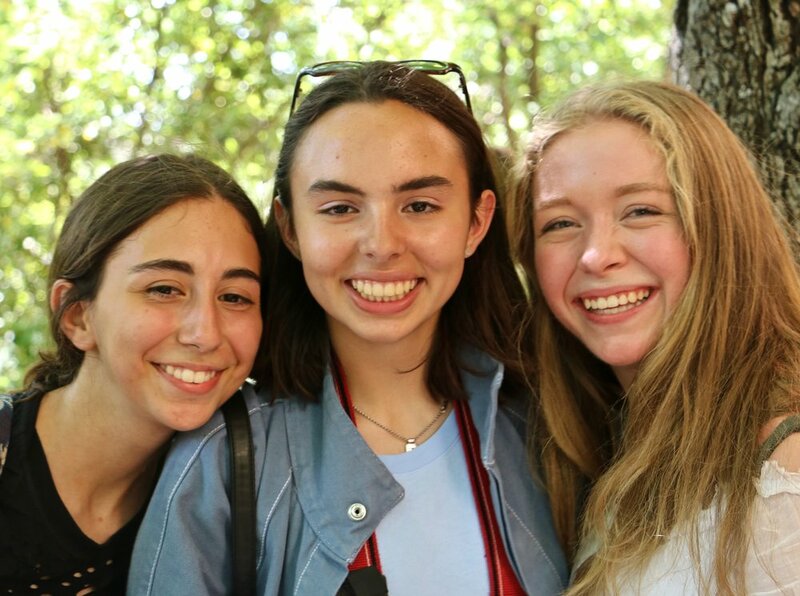 With the program approaching the halfway point, we traveled to Aix-en-Provence for our second major excursion. 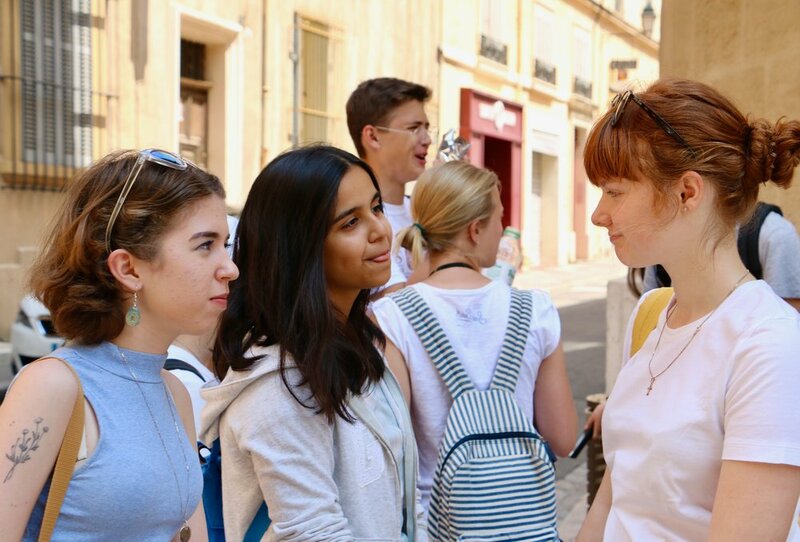 Upon arrival, the students were greeted by warm weather and the elegant architecture of the Cours Mirabeau and buildings from the 17th and 18th centuries. 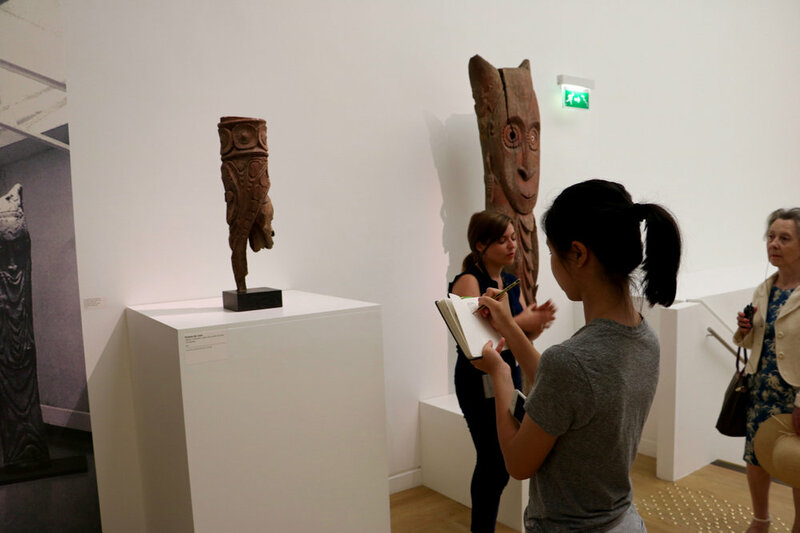 Once gathered, we first visited the Musée Granet, which featured an exhibition of a collection of works from the Jeanne Bucher Jaeger gallery along with the permanent collection. After visiting the Granet, we moved onto the sister exhibit up the road, The Jean Planque Collection. This private artist collection includes pieces produced by Monet, Cézanne, Picasso, and many other well-known artists from the 19th and 20th century, some of whom were friends of Planque. 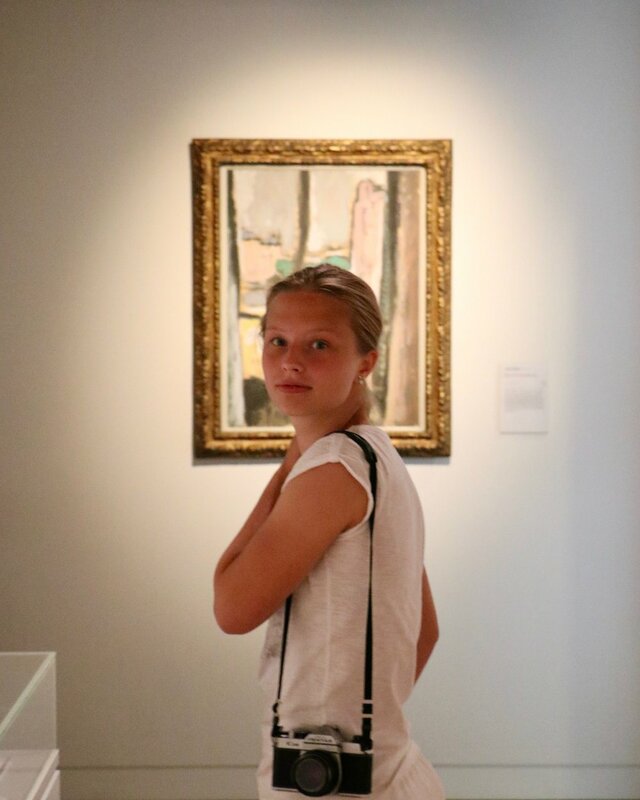 Through these two exhibitions, the students were able to visually position themselves within the development and history of modern art whilst amalgamating individual pieces with their own ideas. We then had a break for lunch and time to shop at the various outlet stores in Aix along with its premiere art store, Michel. 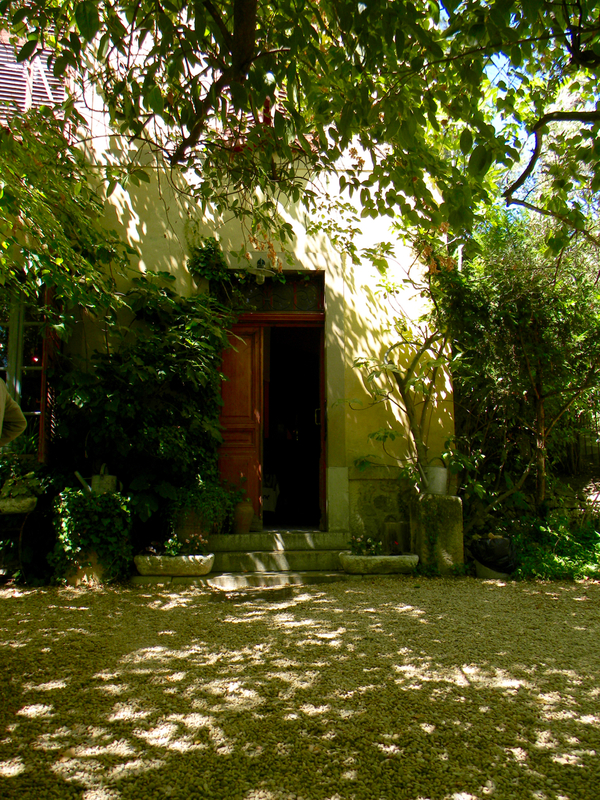 Afterwards, the group then made its way through town and up the hill to Paul Cézanne’s studio. 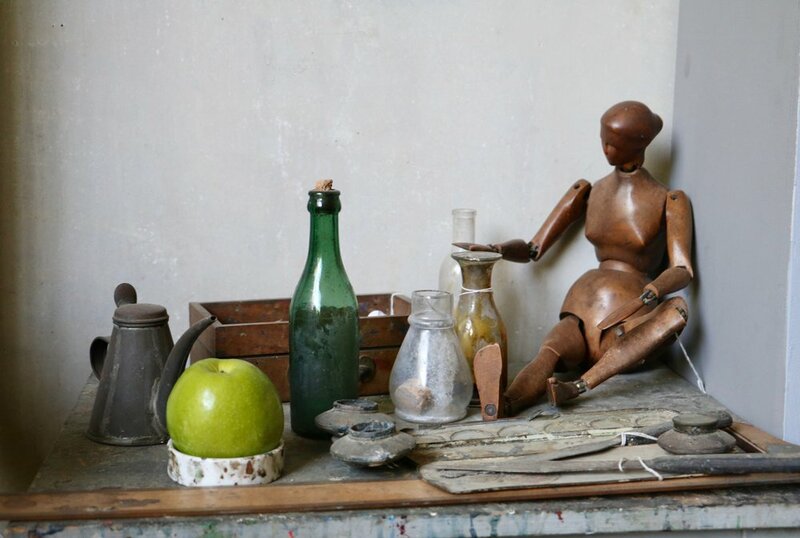 Built during the latter end of Cézanne's career, the studio allowed the students to take a glimpse into the artist's process and take an intimate look at his various still-life subjects and objects that feature throughout his work. Briefly enjoying the shade of the trees outside the studio, we then quickly loaded back up into the vans and made our way to the Pont du Gard. Formerly part of a 52 kilometre long aqueduct, the Pont du Gard is one of the ancient wonders of the world and is a testament to Roman architecture and ingenuity. In the new museum, the group was able to learn about the history of the aqueduct and gain insight how it was constructed. 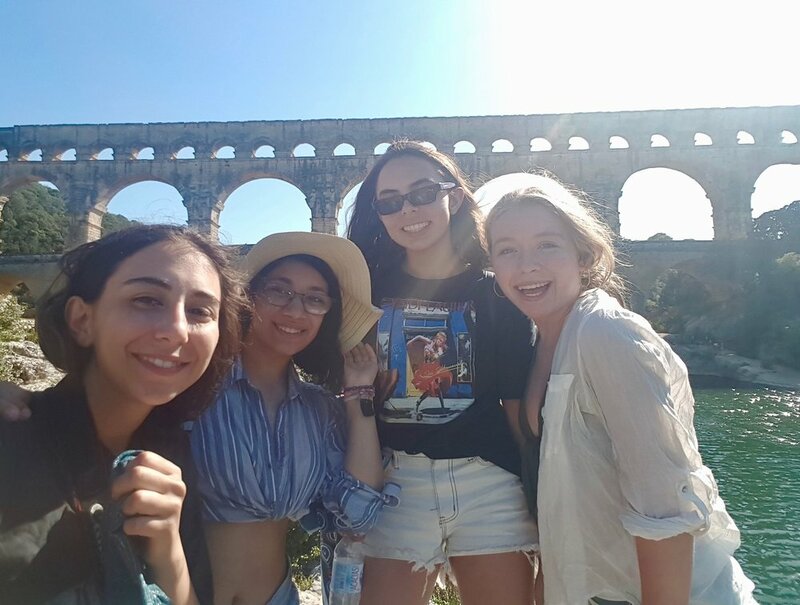 After, the students had time to sketch or photograph the structure and swim in the river below the arches or enjoy some ice cream before driving back to the hamlet. 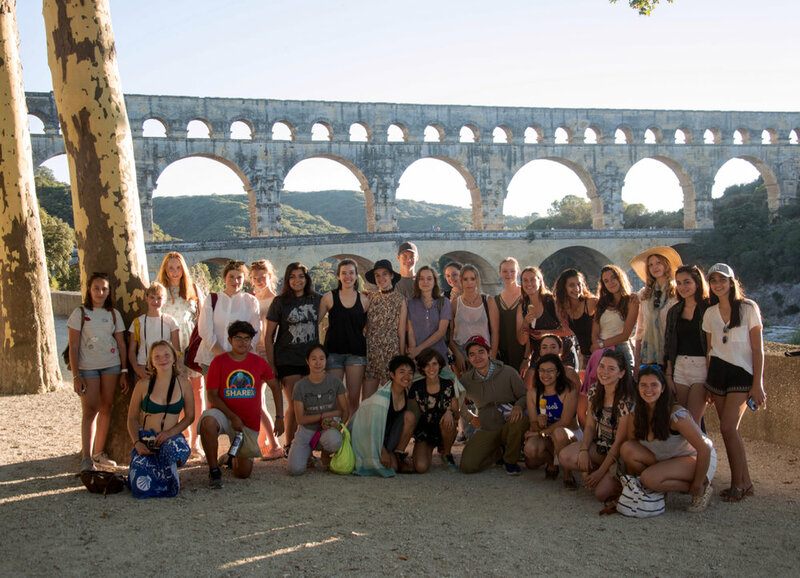 Our visit to Aix and the Pont du Gard has provided a wealth of inspiration for the students as we now enter into the latter end of the program. With upcoming trips to Arles and Mazan, combined with preparation for the final presentations and charrettes, we are gearing up for an exciting final week before our closing banquet. We're all looking forward to seeing the work being produced by both the major and minors. Stay tuned for more! This past Wednesday, after two successful days in both their majors and minors, the group arose bright and early to drive to our first excursion to Avignon. There the students had the possibility to either visit the former stronghold of the Popes during the Avignon Papacy, the Palais du Pape, or visit the Petit Palais which has been reconverted into a gallery of medieval art. 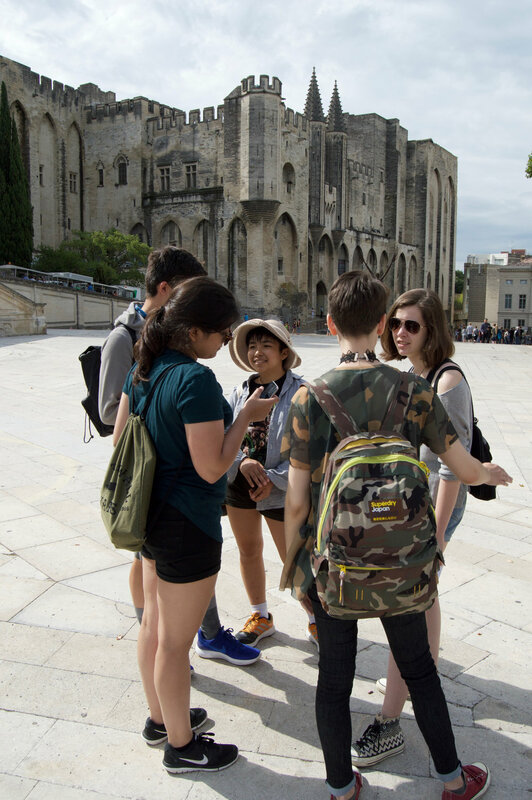 After visiting either of the exhibitions, the students had free time to grab lunch, shop, and enjoy the medieval streets of Avignon. After free time, we drove back to the hamlet and were greeted by a fabulous gazpacho and quesadilla dinner prepared by Perrin and Jenn. After two more productive days, we opened the faculty exhibition in the gallery space and sculpture studio to the students. There, everyone had an opportunity to view the incredible body of work on display before listening to each individual artist talk a bit about the works they selected and their personal background. 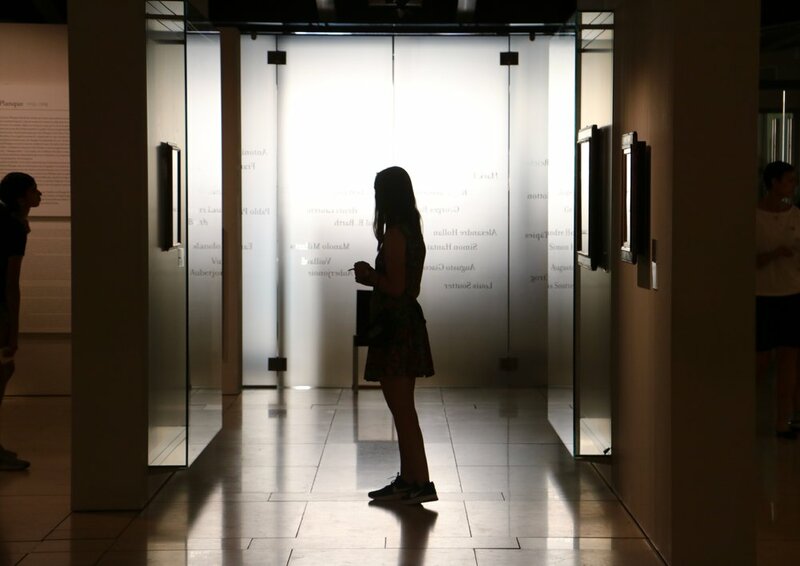 This presented a fabulous opportunity for the students to gain a greater insight into the different medias and genres they are able to explore whilst here at Les Tapies, whilst also allowing them to learn a little more about the faculty members. It has now been a full week since the students arrived and already much has been accomplished both in the major and minor groups. With the architects having finished their first 'Charrette', along with drawing & painting and photography students creating top-class pieces, the enthusiasm and work ethic is definitely gearing up as we move into our second week. In the minors, the students continue to explore their subjects with an acute diligence and are making continuous progress on their projects. With so much taking place, keep a sharp eye on the blog as there is plenty more on the way! After a successful day on Saturday picking up the students from the airport, train station, or meeting those finding their own way, the group wakened to a selection of patisserie and bread from the local town for breakfast. We then gathered for a brief meeting and handed out the satchels for each individual student and discussed the days events. Following the meeting the students ventured up the road and down to the nearest village of Saint-Pierreville for the Sunday market. There we stopped to buy an assortment of food and sweets along with a quick stop at the local cafes before driving back to the hamlet for lunch. 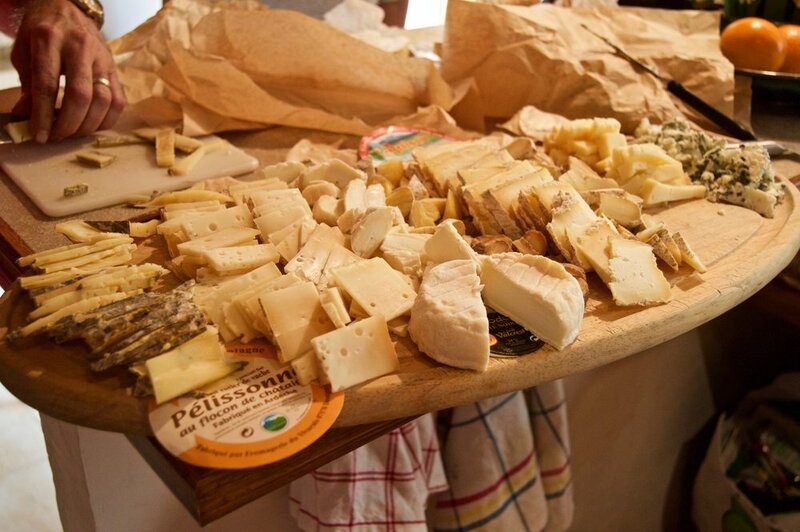 Once the students had eaten and rested they met with their major groups for brief introductory sessions, which then led into our annual Ardèchoise cheese and saucisson tasting. 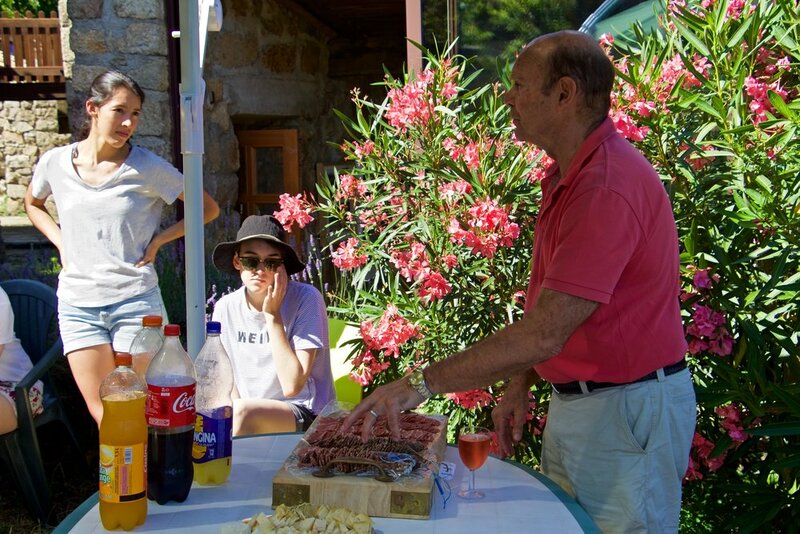 On one of the terraces overlooking the valley, the students enjoyed a variety of regional Ardèche specialities accompanied by some freshly cut baguettes. After dinner, John gave a quick talk on the Ardèche, giving the students an extensive understanding of where the program lies both historically and geographically. Today we officially began the program with our first Major-Major day, where the students took part in activities exclusively in their major - either Drawing and Painting, Architecture or Photography. Tonight, Fernando gives a presentation on his long and arduous restoration of the hamlet. After arriving late in the evening Thursday last week, we've since been hard at work cleaning, setting up, and getting supplies organised for the summer. 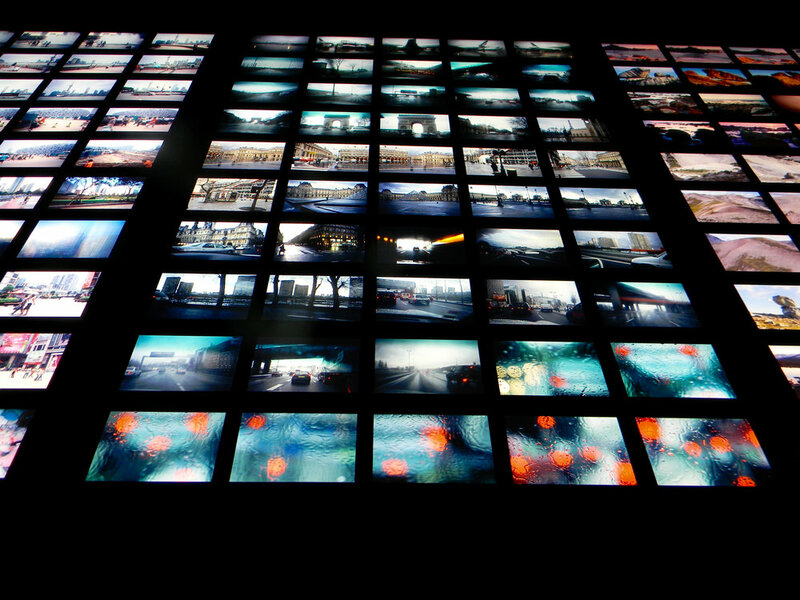 Take a look to see what we've been up to! We were greeted by an awe-inspiring cloud display upon our arrival. The views and surrounding hillsides never cease to amaze us. Something new every year. After unloading the van we began to organise the studio spaces for each of the majors and minors. A glimpse into the layout of our Drawing and Painting studio. Some touch-ups to the walls have been added to lighten the rooms up. Here's Camila getting a helping hand from our resident skeleton. After a four-person shopping trip, Perrin has loaded the 'Magasin' for the first session. With everything prepped, we all had a catch-up meal and meeting before the students arrival tomorrow. Can't wait to get started! Watch our Les Tapies 2016 video! Enjoy our new video overview for our summer student art programs! Video and editing by TASIS student, Mark Chernyshov. After a well deserved break last Sunday, students redoubled their efforts over the past few days both in their major and minors and during our excursions. Drawing and Painting students continued their work both in self portraits, with some progressing to woodcuts. The fabled road painting session was met with enthusiasm and enormous focus. Photography students pressed on in exploring and mastering new shooting and darkroom techniques and expanded their repertoire through hand-colouring and studio lighting tutorials. After their first charrette session, the Architects launched themselves into the initial steps of their final project, a conceptual design of a new building to be added to the hamlet. In the minors, Drawing and Painting along with Photography have continued to produce wonderful work, whilst Design and Build and Art History have progressed rapidly into the finer details of their tasks. With final presentations drawing close, students continue to produce work that highlights their aptitude in each one's field. 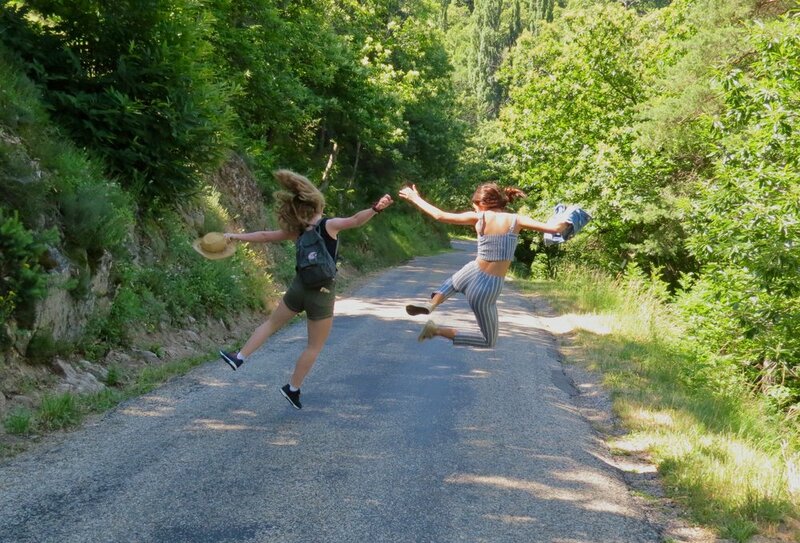 Amongst the hard work and focused atmosphere at the hamlet, students have enjoyed a number of excursions for new subject material, to expand their knowledge, and ultimately to enjoy the pinnacle of French culture and society. 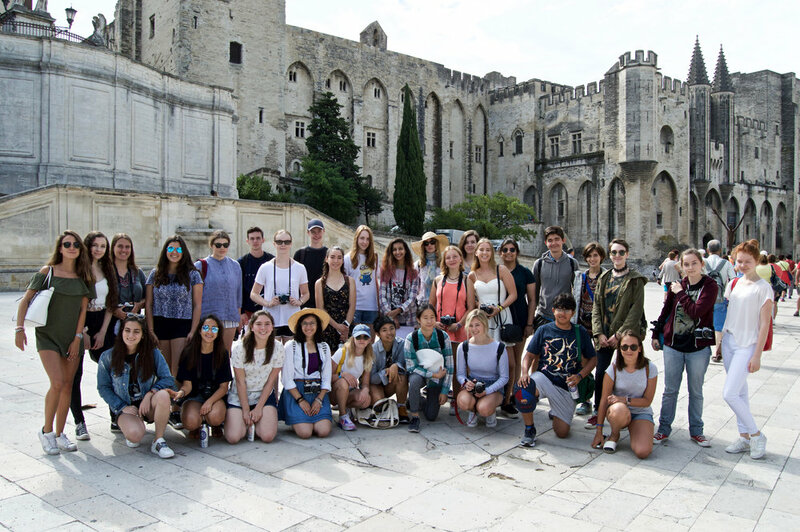 On Wednesday the entire group travelled to Aix-en-Provence. After a smooth journey, students visited La Planque collection, which is located in a vacant church. 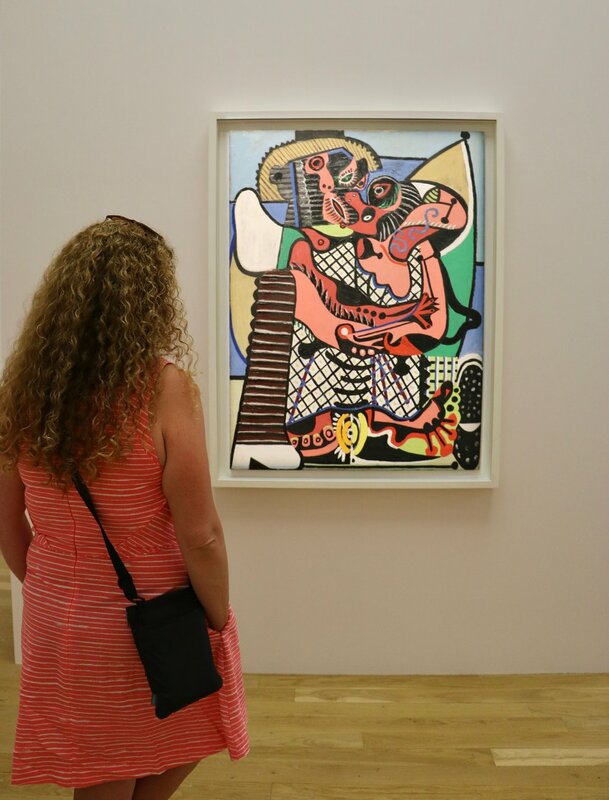 The collection features the work of Picasso, Monet, Jean Planque himself, and many more. Afterwards, students ate lunch before finishing our visit of Aix by walking to Cézanne's studio. 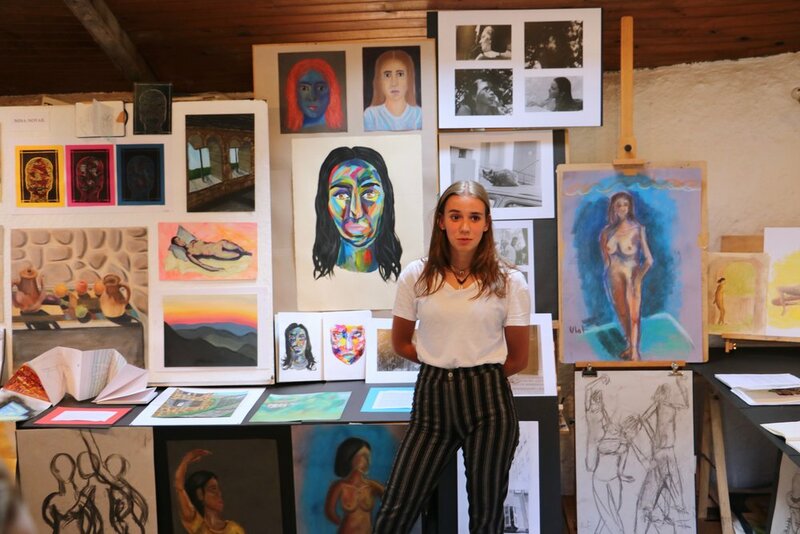 On Friday, Drawing and Painting students along with the Architects visited the 11th century Cistercian Abbey de Mazan, located deep in the massif central. Upon arrival, John and Fernando gave a quick tour before the students sketched, photographed, and painted different facades and views of the half restored Abbey. 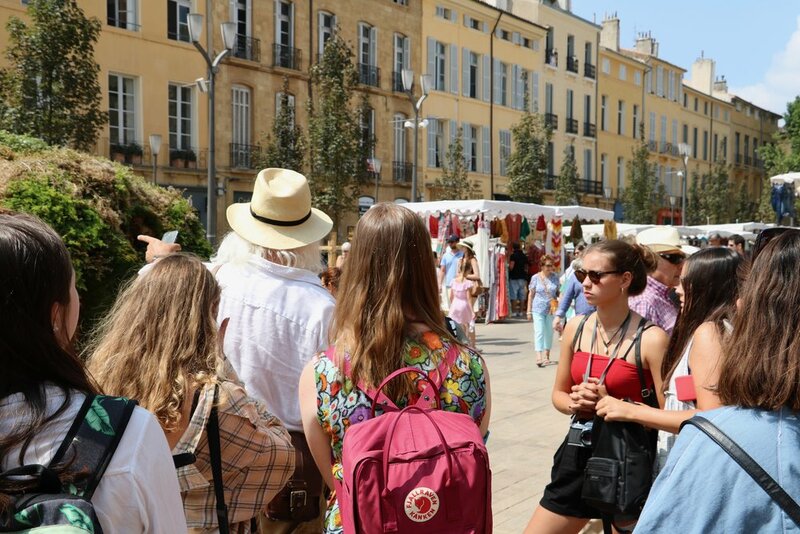 Meanwhile, photography majors travelled to Arles where they had the pleasure of seeing the famous international Les Rencontres photography festival, which this year was focused on story telling. Amongst excursions, studio time, and any free-time, students have had the opportunity to take part in drumming and movement sessions along with more relaxed open studio hours, all of which have been thoroughly enjoyed. It is quite clear that the students are making the most of the Les Tapies experience as they have explored every facet available to them. Over the last week, staff have been working endlessly to bring the facilities and materials up to speed. Eagerly awaiting the arrivals of the students tomorrow! L'Atelier is stocked and ready to go! The shelves are stocked in Drawing and Painting. The model of the hamlet is ready to go! New additions to the photo-lab and darkroom. Excited to see the results in the coming weeks! 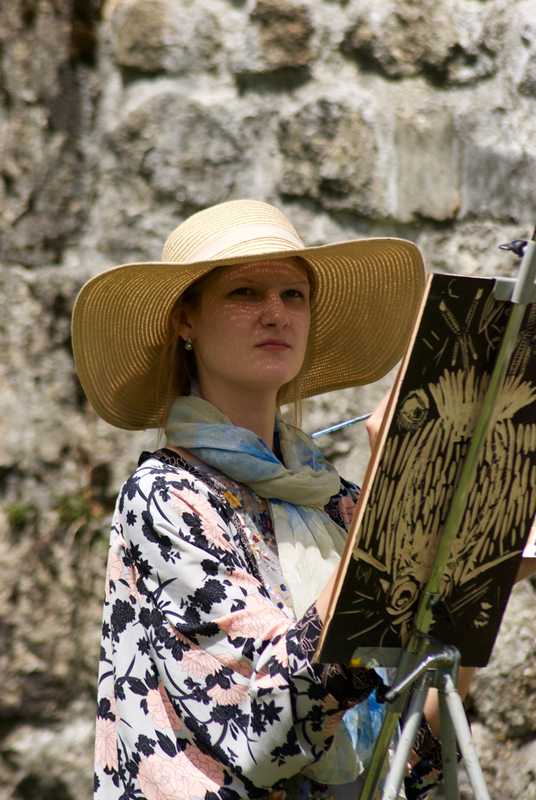 Early morning plein-air painting session to test out the materials and supplies. Adding the final touches to the facilities! Excursion to Aix-en-Provence and Bastille Day Talent Show! 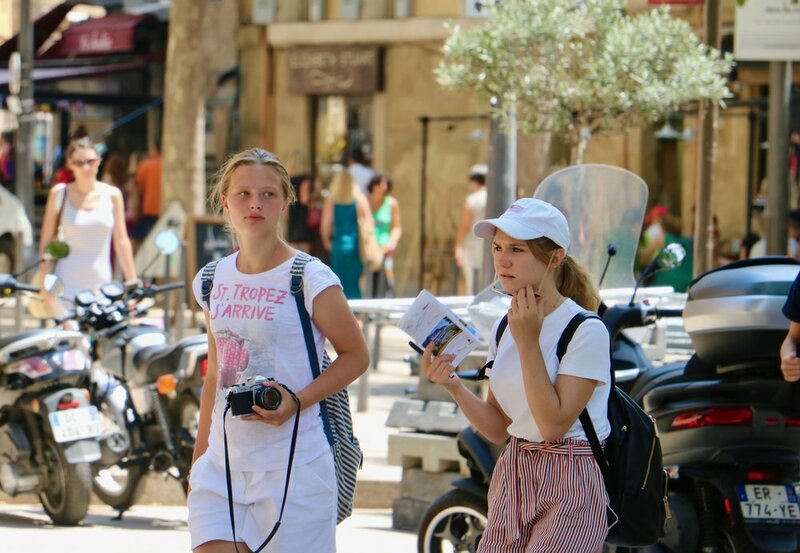 On Sunday, July 12, students enjoyed an excursion to Aix-en-Provence. 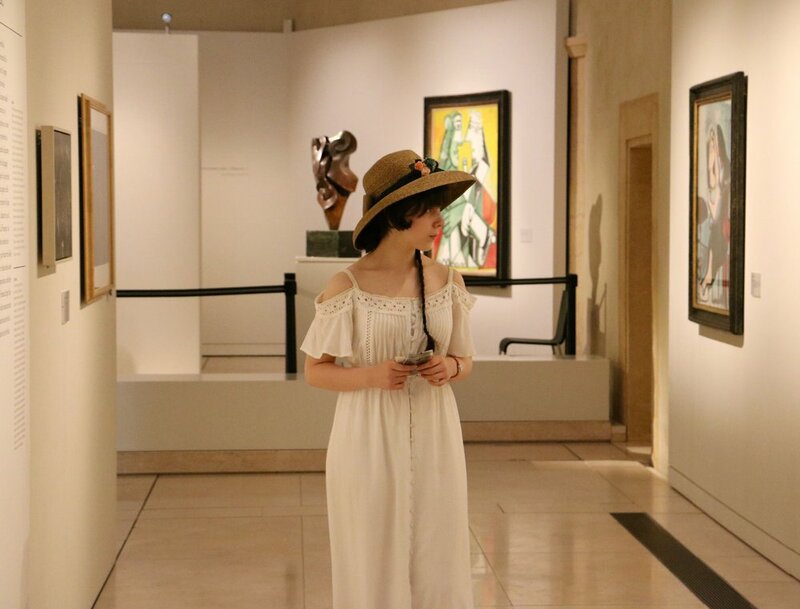 This trip, the last of the programme, brought students to the studio of Paul Cézanne, the celebrated Impressionist, and later to the Musée Granet. Having left Les Tapies at about 7am, the programme's vans arrived in Aix just before 10. 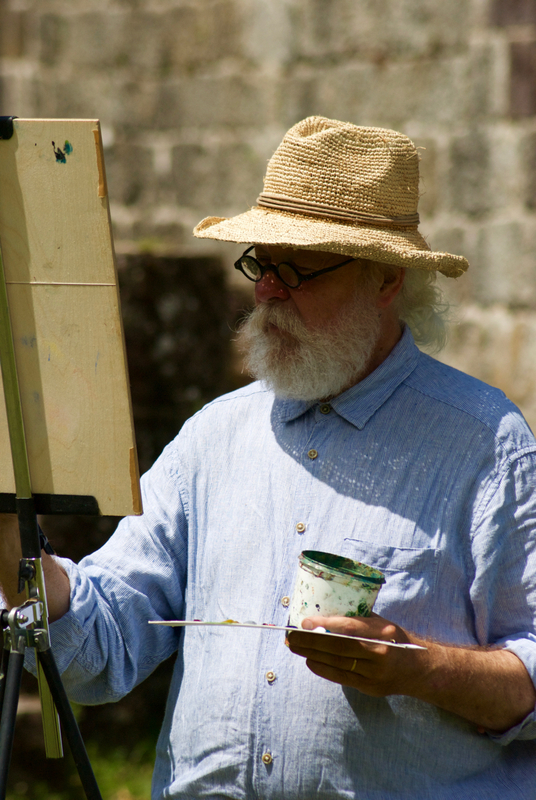 The gates to Cézanne's studio were opened just as we arrived, and programme participants relaxed in Cézanne's garden before being invited in for a tour. 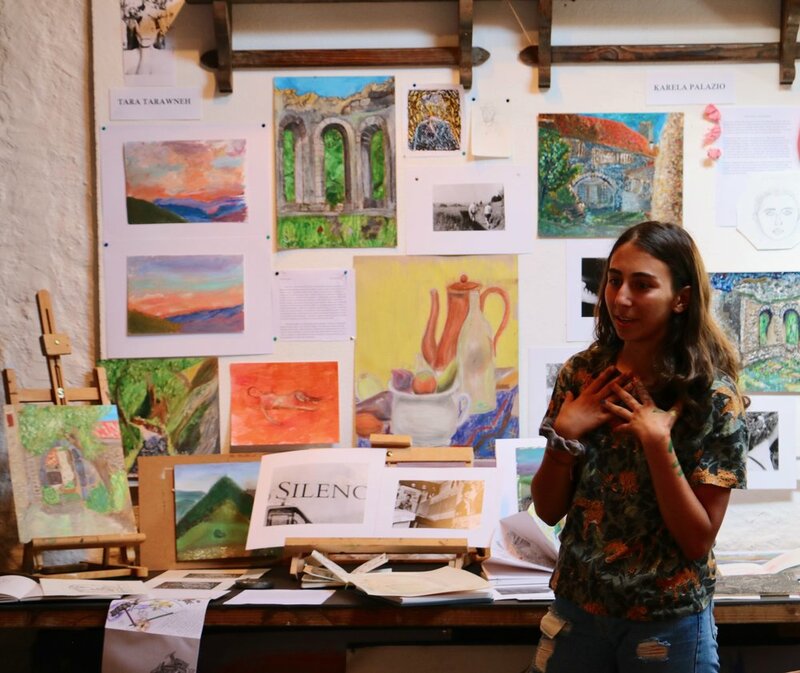 Back at Les Tapies, the reality of final presentations and exhibitions began to set in, and students worked furiously to complete their portfolios and prepare their work for display. The audience was very impressed! But then the mood shifted as he regaled the programme with a spooky tale of spirits - appropriately enough, he was interrupted midway through by the sound of creaking, emanating from an empty corner of the terrace. Yesterday, Les Tapies students once more were asked to wake up very early for another day of travel and art. On the day's itinerary were the 12th century Cistercian abbey of Mazan, and an incredible reconstruction of the Chauvet Caves, home to an incredible array of 36,000-year-old cave drawings. After a sleep car journey of about an hour and a half on winding mountain roads, we reached the site on the French Massif, a region whose elevation of 1,360 metres is more than double that of Les Tapies. Students arrived at the abbey and were given a guided tour in French, translated into English for them by photography assistant Thurston Smalley. First occupied in the 12th century, the abbey was at one time home to over 300 people, including monks and laymen. The oldest part of the Abbey, a ruin of the original church, was in use in varying capacities until the early 20th century when the Abbey's new pastor decided the 700-year-old masterpiece of Cistercian architecture was too large and too cold for his congregation. He had the building almost completely demolished, leaving only ruins, and the congregation moved to a new church, pictured below. Students set to work around the abbey after the tour. At the conclusion of the visit to the Abbey of Mazan, students were taken to the Pont d'Arc for a very quick break. From there, students were taken to the nearby Chauvet Cave reconstruction. Unfortunately, photos were forbidden inside the reconstruction - but not in the adjacent museum where students were taken after their tours. After a very full day of travel and work, students returned to Les Tapies at around 9pm for a wonderful meal of niçoise salad and quesadillas. Another great end to yet another great day!